When building a website, small business owners often concentrate on the specific things that make a good website, such as a clear-cut navigation, strong visuals and a suitable color scheme. Of course each of these are important, but there are many other factors that compose a strong business website. In this article, we identify five things that are vital to a successful website that you may be missing. If a visitor is browsing your website for the first time, your About Us page is often the first page they will navigate to, to find out more about your business. A website lacking this page may seem faceless and less credible. By adding an About Us page to your business website, you are giving your site an identity. Tell a story – Give the details behind how, where or why your business was founded. Use facts to support your statements – Don’t simply say “our support team is fantastic” or “we have a unique product”, instead show that those statements are true by using data or facts to back-up your statements. Be sincere – Don’t try to be something you’re not. If you have a small (or even a one-man) team, don’t pretend to be a large organization. Instead, be truthful on your About Us page, explaining the benefits of operating as a small team for both you and the customer. Demonstrate your expertise – Include any qualifications, awards or press mentions that may be relevant to your business. These will help position you as an expert in your field. It is important, however, to pay close attention to your wording, as bragging about your achievements can be off-putting to your leads. Use real photos – Natural and un-staged photos of you or your business will help to enhance and support your About Us page, making it feel more genuine. Lastly, don’t forget to add some personality in your About Us page. Have some fun with your content – website visitors will appreciate the humor, and injecting personality into your copy will help them get to know you. Visitor landing on your website are often researching your company or gathering information. If, however, they want more information about your business, or would like to express an interest in your product or service, this should be easy to do. Contact details should be prominent and easy to find. 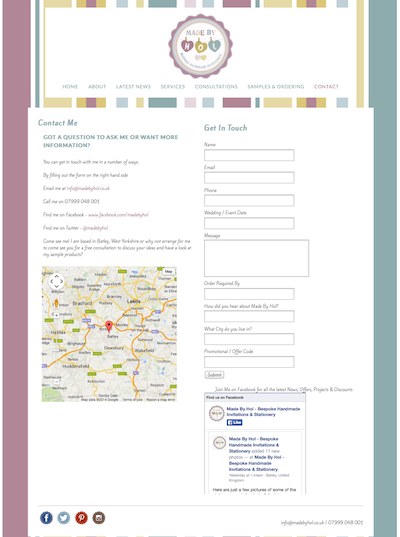 A dedicated Contact Us page shown in the top level navigation is a great way to do this. Your Contact Us page could feature a contact form as well as phone, email and social media contact details. It’s also a good idea to add your postal address, phone number and email (if appropriate) to every page of your website somewhere prominent, such as in the footer. Here’s a great contact page example from one of our user’s, Made by Hol. She has included their email address, phone number, social media profiles as well as a detailed contact form. Her email address and phone number is also featured on every web page of their site making it easy for customers to contact them when needed. With 4 out of 5 consumers using smartphones to shop, there is even more emphasis on creating a mobile friendly browsing experience for your web visitors. Browsing on the small screen of a mobile phone or tablet is a very different experience to that of desktop browsing, so it is important to adapt your website for mobile visitors. Creating large calls-to-action that are easily clickable. Implementing a simple navigation that is easy to browse and scroll through. Adding click-to-call functionality that allows web visitors to call your business in one tap. Displaying location maps that show where your business is located and that will provide directions to your business from wherever your customer is located at that moment. For more information on each of these features, check out this post. The good news is, at Yola we make it easy for you to create a mobile-friendly version of your website. Use this tutorial to learn how to quickly enable our mobile publishing functionality. Metadata is used to explain to search engines what each page of your website is about. They will use this data, as well as other factors, to determine how relevant the content is for specific search terms and then decide whether to display a page within search results or not. Metadata can be added to your Yola website easily within Page Properties in Sitebuilder. Before adding metadata, it is important to conduct keyword research into which search terms will generate good profitable traffic to your website. Once you have identified these terms, they can be added to your site’s metadata in the Title tag and Meta Description and in the body content of each page. The final thing often missing from a business website is an up-to-date blog. A blog is a great way to continuously add content to your website after your site has gone live. There are many reasons why starting a blog for your business is a good idea. It’s a good way of keeping customers engaged and returning to your website and also gives you a channel to announce any changes to your products or services. Blogs also help to position you as a thought leader within your industry. One of the major reasons for creating a blog is to take advantage of the SEO benefits it will provide. If set up correctly, and regularly updated with relevant thoughtful articles, a blog will provide fresh, up-to-date content that search engines will look favorably on. As well as that, the more readers attracted to your blog, the more likelihood there is of those visitors sharing your content, and thus creating backlinks to your articles. These backlinks will in turn will help the SEO of your website. A blog can be easily set up on your Yola website using our Tumblr integration, check out this tutorial to learn how to go about this. So, how many of these features you included on your website? Tell us, by commenting below.